L.J. felt like "a number"
The latest player to criticize the Eagles' family for its coldhearted treatment of players is L.J. Smith, who spent six seasons with the organization. Smith told Sporting News Radio Thursday he felt like "a number" in 2008, his last season with the Eagles. Considering the Eagles paid him the $4.5 million franchise number this past year, then took away his starting job, he probably was a number in the eyes of the org. And not a good one. That said, Smith sounded a lot like Brian Dawkins and Tra Thomas after their respective exits - unwanted. "I think I was just treated more like a number last year," Smith said. "There were a lot of things that I felt like should have been handled differently and you know there were a couple of times where coach should have came up to me and explained how he was looking at things and how he was handling situations and what direction he wanted to go but it didn't happen like that. As a player you never want to hear things through the media. "You just want to be treated like a man before an athlete I think a lot of times in the NFL coaches forget that. They're so involved with the numbers and schemes and they forget how to approach a player and I just felt like a couple of times throughout the season last year there were a couple of coaches who forgot that." Smith hasn't been promised anything by his new team, the Baltimore Ravens. But something tells me he will relate to the approach of Ravens head coach John Harbaugh, the former Eagles assistant, and take the starting tight end job from Todd Heap. head coach/executive vice president of football operations Andy Reid. It was same old, same old. Regardless, when you cut through the spin Reid basically said letting Eagles icon Brian Dawkins walk in free agency instead of doing whatever it took to keep him was "Just business." Reid also said the lines of communication were open with quarterback Donovan McNabb. Not open enough for McNabb to leave town and workout, though, after spending a lot of time hanging around the practice complex. The loss of Dawkins obviously had something to do with that. One of the more revealing parts of the interview was about change. Reid said "Change doesn't hurt. Sometimes it can be good and sometimes it can be bad. The way we evaluate what we've done we think is good." The one thing that hasn't changed is Reid. He's preparing for his 11th season as head coach. The Eagles have won 10 regular season games just once in the past four years. Despite their miraculous late-season ascension, one stoked by Dawkins, they're coming off a 9-6-1 campaign. If nothing changes with the leadership up at the top, nothing changes. And it looks a lot like the Eagles are running the same old plays that got them where they are. A one and a two. That's how many years McNabb has left with the Eagles. 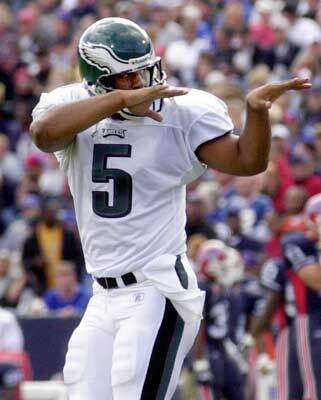 Donovan McNabb couldn't keep his thoughts to himself any longer. The pain '5' felt when best friend Brian Dawkins left the Eagles to sign with the Broncos was compounded by big-brother type Tra Thomas' exit for the Jaguars. McNabb hit his blog hard (http://www.yardbarker.com/nfl/articles/Tra_B_Dawk/538341). "I usually don't remark about teammates unless asked but I felt it was necessary to share my thoughts on a couple of teammates that are no longer in Philadelphia. I have been a part of the Philadelphia Eagles for 10 years and I have not played a game, attended a practice, sweated in training camp, built a playground or participated in a Carnival, and more importantly dreamed of a championship parade, without Brian Dawkins and Tra Thomas being a part of it. We all had a goal of bringing a championship to this city and while we didn't achieve that goal, we have had a lot of successes during our time together. I was always confident that Tra had my blindside. When he was out there it was one less thing to worry about. As for Brian, mere words cannot explain what he has meant to me, our team, and the City of Philadelphia. He and I shared many things besides a locker room. We shared a passion for the game, a desire to make a difference, and dreams for better things. "There may be other men to come in here and play these positions and hopefully we can share successes. I will always regret not having the chance to win a championship with these guys. It is important to note that I also will miss playing with a few other guys as well. Correll Buckhlater, Lito Sheppard, Greg Lewis, and Sean Considine will all be missed and I do wish them all success." OK, he almost lost me on Lewis. But to be fair, Lewis looked out for teammates with eccentric anti-media behavior quietly encouraged by the organization. Eagles president Joe Banner said Wednesday he made veteran safety Brian Dawkins “a good, fair, strong” contract offer to stick around for a couple of years. But Banner was more ambiguous and political than clear and straightforward in attempting to explain why Dawkins signed last weekend with the Denver Broncos during an interview on WIP Radio. Dawkins told 950 ESPN Radio that his agent, Jim Steiner, didn’t bounce the deal off the Eagles to see if they would sweeten the pot, intimating that the club had put its best foot forward. Banner said he wished he had been able to speak personally with Dawkins or his agent one last time. Moments later Banner said another conversation probably wouldn’t have mattered anyway. It was that type of interview. And there won’t be any more clarity for a while because a spokesman indicated Banner is unwilling to address questions from the mainstream media. Dawkins signed a five-year $17 million contract with the Denver Broncos last weekend. For all practical purposes, the contract is for two years and $9 million, with $7.2 million guaranteed. It voids after the second year. The Eagles essentially offered two one-year contracts with just $2.5 million guaranteed according to ESPN 950\'s Brian Seltzer. While Banner insisted the Eagles “tried” to keep Dawkins, listeners had to be scratching their heads when he spoke about the player’s decision to test free agency. “We can’t control that he decided to explore what else was out there,” Banner said. If Banner really wanted to keep Dawkins, however, he could have tied him up with he one-year $6.34 million franchise tag or one-year $5.45 million transition tag. The Eagles didn’t tag anyone. Banner touched on other subjects as well. He disputed the Eagles had $40 million of salary cap space, explaining it was more like $25 million. Banner neither confirmed or denied reports he met with quarterback Donovan McNabb in the offseason or discussed a contract extension with him, as reports suggest. But Banner clarified from his end what McNabb meant by adding more weaponry; i.e. weapons are not just wide receivers and running backs. Additionally Banner thinks Brian Westbrook will be good to go next season despite knee surgery. Nonetheless the Eagles will protect themselves at running back. They have two picks in the first round of the draft, numbers 21 and 28 overall. “I’m not going to rule out free agency but I think it’s much more likely that the draft will be where we address that,” Banner said. Banner didn’t sound at all as if free agent offensive tackle Tra Thomas would be back. And he didn’t quash rumors that cornerback Sheldon Brown wants a new contract, saying “That’s the norm. “I don’t want to get into specifics,” Banner said. “This has not been presented to us as some big problem. When Eagles president Joe Banner walks past the auditorium inside team headquarters he cannot help but feel angst. Decorating the walls are examples of the most recent carnage of free agency, and painful remembrances of the good old gold standard days. Seven of the 15 blown-up photos in the foyer outside the news conference center have former Eagles on them - Brian Dawkins, Correll Buckhalter, Sean Considine and L.J. Smith. All have signed with other teams or in the case of Smith, agreed to terms to do so. Among the golden moments is Buckhalter reaching the ball over the goal line for a touchdown, a play immortalized by photographer Drew Hallowell. Though the scenery is about to change in a hurry, the memories will live on. Will Thomas follow Sean Considine (above) to Jacksonville? The Jaguars met with free agent offensive tackle Tra Thomas, according to a report in the Philadelphia Inquirer. With Khalif Barnes making the rounds in free agency, the Jaguars have a vacancy. With the addition of tackle Stacy Andrews and the Eagles' front office fresh off another statement in what to pay 30-something vets (i.e. Brian Dawkins), the 34-year-old Thomas has good reason to shop around. If Thomas signs he would be reunited with former Eagles safety Sean Considine, who inked a two-year pact with the Jaguars. The Eagles are interested in free agent running back Derrick Ward, who rushed for 1,025 yards and two touchdowns last year with the New York Giants, according to reports. Ward (5-11, 228) turns 29 in August. He met with the Broncos, and the Buccaneers also could be interested. In a complementary role to big back Brandon Jacobs, Ward averaged 88 yards from scrimmage per game. Ward notched 5.6 yards per rush and 9.1 yards per reception, grabbing 41 passes for 384 yards. 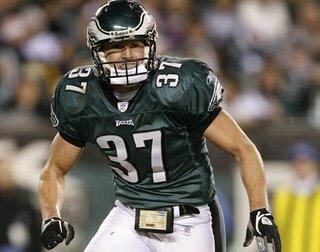 Safety Jim Leonhard (5-8, 186) is more Sean Considine than Brian Dawkins, both of those safeties leaving the Eagles in free agency. Leonhard, 26, registered 69 tackles, including a sack, and returned an interception for a score starting 13 of 16 games for the Ravens.He stepped in for injured starter Dawan Landry.